The story has been told many times. 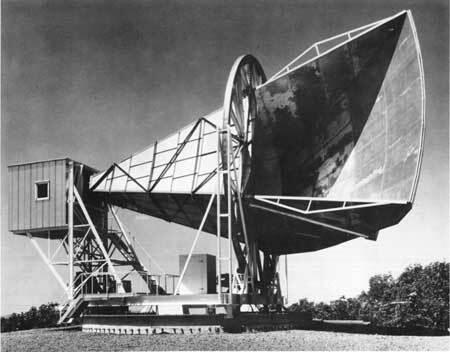 The detector had an annoying and remarkably intransigent "hiss" and Penzias and Wilson knew it was the detector, since the hiss didn't change as they pointed their antenna at different places in the sky. A radio hiss can be converted into a temperature: a red-hot coal has a temperature of a few thousand degrees Celsius but this hiss was microwave-hot, putting it just a few degrees above absolute zero. The never got rid of the hiss. Instead, through the academic grapevine, they found themselves talking to a group of Princeton astrophysicists. In the 1940s it was realized that if the universe began with a big bang (an idea invented in the 1920s) it would have a detectable afterglow. In the early 1960s, the big bang was gaining traction among astrophysicists but the competition between it and the competing steady state proposal was far from settled. The Princeton crew were working on a detector to look for this afterglow, and realized that Penzias and Wilson had already found it. Comparing notes, the two groups published back-to-back letters to the Astrophysical Journal. Penzias and Wilson simply reported their results (and their painstaking efforts to eliminate other explanations) while the Princeton scientists provided the interpretation. Penzias and Wilson's letter was entitled A Measurement Of Excess Antenna Temperature At 4080 Mc/s -- a masterful understatement. As legend has it, the impact of their work only hit home when it made the front page of the New York Times. In 1978 Penzias and Wilson won the Nobel Prize -- certainly the first and very likely the time last two telephone company employees get to stumble across one of secrets of the universe. For cosmology, the microwave background is the gift that keeps on giving -- it has done far more than simply tell us that the big bang happened. Right away, the smoothness of the microwave background confirmed that the early universe was almost the same at every point. The largest departure from smoothness arises because the earth (and the sun and the Milky Way) are all moving, relative to the "frame" defined by the microwave background. The microwave background is redshifted on one side of the sky and blueshifted on the other - telling us that the Milky Way galaxy is moving at around 600 km/s relative to the average position of all the matter in the universe -- a number first measured in the 1970s. Fast forward to the 1992, and the COBE satellite team announced that it had made the first measurements of the differences in the temperature of the microwave background at different points in the sky; 10,000 times smaller than the temperature of the background itself. Today the departures from smoothness is more interesting than the background itself -- information contained within a map of the microwave background can tell us how the big bang happened, and what the universe looked like in the first minutes and years after the big bang. Mather and Smoot, two leaders of the COBE team, won the second microwave background's second Nobel Prize in 2006. After COBE, a host of ground-and balloon-based experiments have contributed to the analysis of the microwave background and from 2001 to 2010 a second satellite, WMAP, compiled an exquisitely detailed map of the microwave background. What do we get from this? In combination with other data the microwave background tells us the age of the universe and the amount of dark matter it contains. It lets us explore the mechanism that produced the tiny departures from smoothness in the microwave background, the same mechanism which sewed the seeds that led to the formation of galaxies and planets and stars (and, ultimately, people) as the universe evolved. Not so long ago, estimates for the age of the universe varied by a factor of two -- in 2013 the consensus is that our universe is 13.7 billion years old, a number good to within a few percent: thanks to the microwave background, cosmology has become a precision science. And on Thursday morning -- March 21 t 10am CET -- it all changes again. Planck, the next spacecraft to study the microwave background, will release its first map of the microwave sky, and announce its first batch of cosmological results. Planck improves on WMAP the way that WMAP improved on COBE: whatever the Planck team tells us tomorrow, our understanding of the universe is going to change. plan to live-blog and tweet (@reasther) the Planck results as they are released.